Long before I reached Peru I knew it was going one of the culinary highlights of my trip. A couple of important factors come together to make Peruvian food so outstanding. First, their long and complex history. They had the pre-Incan cultures, the Incas themselves, the Spanish colonisation and later influences from the rest of the world, particularly Asia. Second is their landscape. Since the time of the Incas they have understood the potential to create microclimates at various altitudes in the mountains. The upshot of this is a reduced impact of seasonality on the produce which they can grow so that they can use almost every ingredient all year round. This combined with the bounties of the Pacific ocean and the Amazon means they have a wide and varied palette with which to create. The third reason is that they work really hard to ensure they make the best use of these advantages and to make sure that they are always creating and pushing the boundaries with their efforts. Two of the 10 best restaurants in the world are in Lima. I really enjoyed eating my way from one end of the country to the other. The word chicharrón can be seen on menus all over the country. It's basic meaning is crunchy and deep-fried. They have chicharrón de pollo (like KFC popcorn chicken), chicharrón de marisco (like scampi) and lots of other chicharrónes. But if it is written as 'chicharrón' by itself it means deep-fried pork belly. I've seen various approaches as to how it's delivered, some giving more of the meat of the belly, others providing almost exclusively the fat, nice and crispy. My absolute favourite was the one I had in the market in Arequipa which came with a nice salad, potatoes and crispy corn. From the time I left home I had ceviche on my mind. It's popular all over the world these days and a regular feature on lots of nice menus but it's nothing new to the Peruvians. I had tried it at home in Ireland but I wanted to get to the source. It's made by 'cooking' fresh fish in acid. It's not really cooked; the acid denatures the proteins in the fish in such a way as to give it the same texture and appearance as cooked fish. There are lots of variations on this using all kinds of seafood but my favourite is the simple classic using fresh white fish. The normal mixture used to acidulate the fish is a combination of lime juice, garlic and chilli. On the plate, it's normally served with sweet potato, a tomato and onion salad (dressed with virtually the same thing as is on the fish) and some kind of corn. The most important factor is the freshness of the fish, according to Peruvians. I was even told that the people in Lima won't eat the morning's catch as ceviche after lunch. Its not fresh enough! I felt a little like I was on a pilgrimage from Ireland returning to the home of the potato where Walter Raleigh first gathered these beautiful gems with which we have a history of mixed emotions. I thought I knew of every kind of potato and every use to which they could be put until I got to Peru. They have over 2,500 varieties of potato and a couple of new tricks for using them that I had never seen. One of these novel uses of the humble spud was causa. It is made mixing mashed, boiled potatoes with oil, chilli and lime juice. This is assembled in layers with a chicken salad or a tuna salad. I'll definitely be giving it a try when I get home. The method of cooking the potatoes themselves isn't particularly novel, they're just boiled, but I've never had potatoes with a sauce like this. It's made from spicy chillis, onions, garlic, cheese and evaporated milk. Savage! Just like the potatoes, I hadn't realised the breadth of variety that existed in corn until I got to Peru. I knew we had sweetcorn in cans and on the cob, I understood farmers grew maize for animal feed and I recognised that the corn in popcorn was different from these. The only other slightly unusual corn I had seen was in the blue corn tortillas made by a great little operation in Tipperary which apparently are very are closely linked to Central America. In Peru they make drinks, desserts, salty snacks, breads and lots more from the huge variety available to them. Chicha morada is a sweet drink. It's made from the blue corn (which looks almost black) and has a purple (morada) colour. It's available all over Peru made fresh or from powder packets. It has a lovely cinnamon touch to it and apparently it's central to many a child's birthday party. One of the uses of corn I loved in Peru was the crispy corn given out as an amuse bouche. It's crunchy, light and salty. It would make a great bar snack too. They also use it as a garnish on meals and I had it both on chicharrón and ceviche. I won't say much about this dish as I was quite disappointed with it. In a country so adept at their food, I found the range of cheese available in Peru lacked flavour and maturity. There seems to be just one type of ubiquitous queso blanco (white cheese). This is probably the most obvious example of the Asian influence on Peruvian food. Basically it's made up of onions, peppers and slices of beef, stir-fried in soya sauce. It's normally served with rice and chips. It features regularly on set menus all over Peru and it's a very useful meal for the budget-constrained backpacker. The institute that is picanterias (places that serve food that is picante), are a feature of the Arequipa region more than any other part of Peru. Laid out a little like a bierhaus with long benches, they're at the heart of the community and they turn out a phenomenal amount of food from their kitchens. It was in one of these fine establishments that I had the pleasure of trying rocoto relleno. At first glance, you'd be forgiven for mistaking it for a regular old stuffed bell pepper but rocoto is a pepper unto itself, hailing from the Andes, that would burn the mouth off you. It's boiled a number of times to take some of the sting out of it before it's stuffed with nice things like minced beef, boiled eggs, raisins, ground peanuts, cheese and more and then roasted. Still spicy but very tasty. I'm from Watergrasshill in County Cork. At over 600m above sea level it's the highest arable land in Ireland (or so I was told growing up). Despite this, though I would love to blame my failed cakes on it, I never had to think much about altitude when baking at home. At 3,900m above sea level, Cuzco is a different story. Bread doesn't rise in the same way and water boils at 85°c. As a result of this the bread is all very flat and every kitchen has a pressure cooker (for the ever-present beans). Despite these challenges, however, while hiking the classic Inca Trail, our chef managed to bake an entire cake using only the equipment he had hauled on his back! Cooking isn't the only the only thing that suffers from the altitude. It took us a long time to adjust to the lack of oxygen ourselves. To aid our struggle it was suggested we enlist the help of certain leaves that have been helping the Andean farmers for hundreds of years: coca leaves, the same leaves used to make cocaine. Long before the marching powder was made, however, the people of the Andes were using the leaves to provide them with the vital energy and nutrition they required on long days of work without a packed lunch. These days they're also given to tourists like me in the form of tea, as sweets or as raw leaves to chew to help with altitude sickness. As a parting note I'll leave you with this dessert I had in Lima. 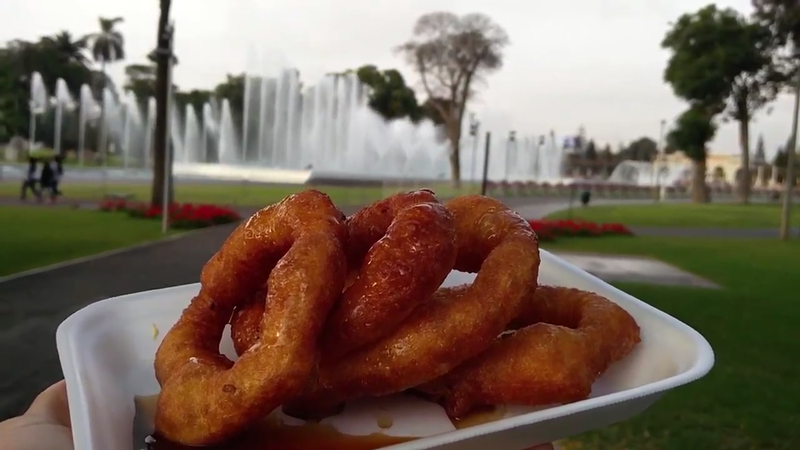 These deep-fried rings are a special kind of donut. They're called picarones and the dough is made from sweet potato and pumpkin. After they're cooked, they're covered in a beautiful sweet syrup infused with cinnamon and orange. A real treat. Despite the fact that I've listed quite a number of delicious dishes here, I've only scratched the surface of the culinary delights Peru has to offer. I absolutely loved their food and I hope to return some day to taste even more.